Art Hoffson was born on August 13, 1943, in Greenville, South Carolina. He entered Officer Training School on September 30, 1965, and was commissioned a 2d Lt at Lackland AFB, Texas, on December 21, 1965. Lt Hoffson then attended Undergraduate Pilot Training and was awarded his pilot wings at Laredo AFB, Texas, in April 1967, followed by F-4 Phantom II Combat Crew Training and Pilot Systems Operator training from April 1967 to January 1968. 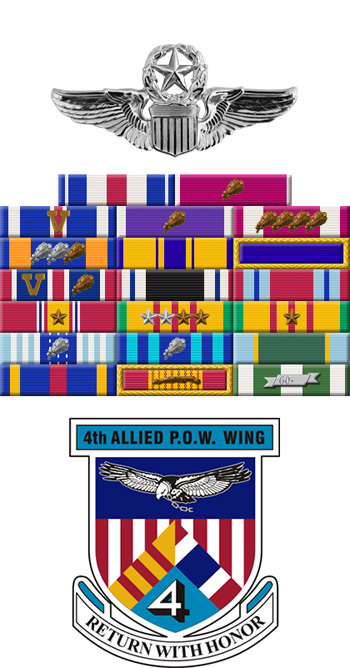 His first assignment was as an F-4 Pilot Systems Operator and Pilot with the 555th Tactical Fighter Squadron at Ubon and then Udorn Royal Thai AFB, Thailand, from January 1968 until he was forced to eject over North Vietnam and was taken as a Prisoner of War on August 17, 1968. After spending 1,671 days in captivity, Capt Hoffson was released during Operation Homecoming on March 14, 1973. He was briefly hospitalized to recover from his injuries at Andrews AFB, Maryland, and then served as an F-4E pilot with the 58th Tactical Fighter Squadron and as Chief of Current Operations with the 33rd Tactical Fighter Wing at Eglin AFB, Florida, from January 1974 to July 1977. 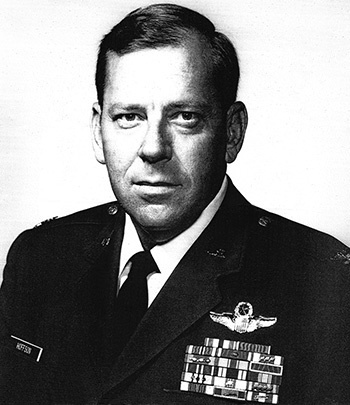 Maj Hoffson attended Armed Forces Staff College from July 1977 to January 1978, followed by service as an Inspection Planning Officer in the Office of the Inspector General with Headquarters Tactical Air Command at Langley AFB, Virginia, from January 1978 to July 1980. Col Hoffson next attended the Industrial College of the Armed Forces from July 1980 to May 1981, and then served with the Directorate of Plans, Deputy Chief of Staff for Plans and Operations, with Headquarters U.S. Air Force in the Pentagon from July 1981 to August 1984. His next assignment was as Assistant Deputy Commander for Operations of the 31st Tactical Fighter Wing at Homestead AFB, Florida, from October 1984 to December 1985, followed by service as Deputy Commander for Operations and as Vice Commander of the 56th Tactical Training Wing at MacDill AFB, Florida, from December 1985 to May 1988. Col Hoffson served with the 479th Tactical Training Wing at Holloman AFB, New Mexico, from May 1988 to August 1990, and then served as Vice Commander of the U.S. Air Force Air Defense Weapons Center at Tyndall AFB, Florida, from August 1990 to May 1991. His final assignment was as Vice Commander of First Air Force at Tyndall AFB, from May 1991 until his retirement from the Air Force on October 1, 1992. Art Hoffson died on June 2, 2006, and was buried at Gwinnett Memorial Park in Lawrenceville, Georgia. During the Period 16 September 1968 to 23 September 1968: This officer distinguished himself by gallantry in action against an opposing armed force while a Prisoner of War in North Vietnam. With complete disregard for his own safety and personal welfare in a period of severe enemy harassment, this officer took complete care of a seriously wounded fellow prisoner without assistance from the Vietnamese. By his courageous actions in an environment of heavy enemy pressure and brutal treatment, Captain Hoffson has reflected great credit upon himself and the United States Air Force.